The 2016 NA LCS Spring Split resumes with week 5! The 2016 NA LCS Spring Split features North America's top ten teams - Counter Logic Gaming, Team Impulse, NRG Esports, Renegades, Team Dignitas, Immortals, Cloud9, Liquid, Team Solomid, and Echo Fox - playing against each other for championship points and a chance to represent their region at the 2016 World Championship! Be sure to read up on the 2016 LCS Spring Split Rule Changes! 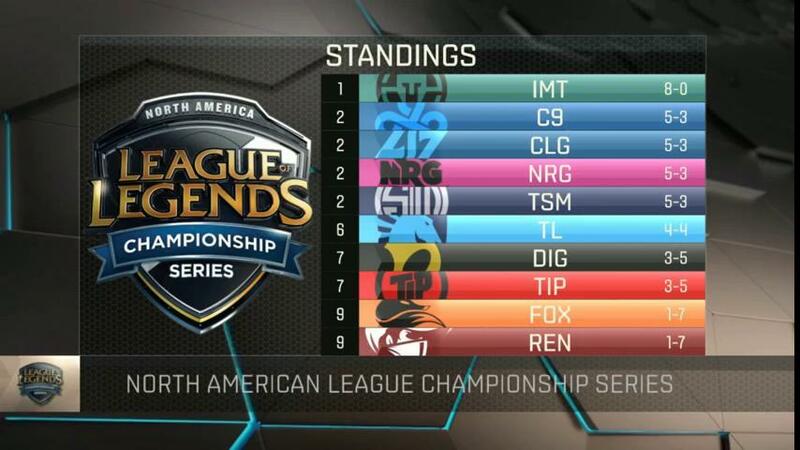 Catch up on current NA LCS rules here. LCS Spring Split Week 5 will be played on patch 6.2, with Jhin enabled! Tune in Sunday night for our weekly installment of TWIES!